AEI energy data analytics and commissioning solutions are built to serve your energy reporting needs from the district level down to the individual energy assets in your buildings. We deliver baseline reporting for RCx and ReCx initiatives; ongoing O&M reporting in a CCx engagement; district and whole-portfolio Eneryg Maps to consolidate many different data sources; and real-time intelligence from the BAS and main meter for your ASHRAE, IPMVP and LEED 4.0 certification processes. Our strength is in the scalable data techniques we've developed, combined with an approach that is agnostic to the peculiarities of your particular BAS/BMS/EMS solutions that are already in place, and a balanced approach that recognizes one size does not fit all. Your budget may dictate that an AEI Soft Start is the right kick-off to getting baseline data for the entire campus, and maybe it only makes sense to engage in a BAS re-commissioning for that one building that sticks out like a sore thumb. When appropriate, we'll use public open source data to provide benchmark references for your comparisons, we'll identify utility rebates when possible. In short, we'll deliver the solutions that are most appropriate for your needs and your budget. Click on any of the products mentioned below for additional details. We've organized them here with a process approach in mind: Start soft with high-level portfolio insight and benchmarking. Then move into the individual buildings once a few outlier buildings have been targeted for a renovation or additional analysis. We'll take your utility data, combined with available land-use and GIS data to deliver a versatile, comprehensive and interactive visual portal that can answer a wide range of questions from a variety of constituencies, from team members on an energy task force to a real-estate portfolio manager and to the general public. An AEI Energy Map is most suitable for cities and towns with disclosure reporting requirements that don't yet have an intuitive and versatile method to show the results to the public or inspect the reported data for public policy decisions. Built from a core set of reusable components, the Map is built to use the data you have available with the flexibility to adapt later when new sources might become available. It runs on our servers branded for you, or as a standalone deliverable that can run on yours. This is a free service that keeps you in touch with the grid conditions in your region. 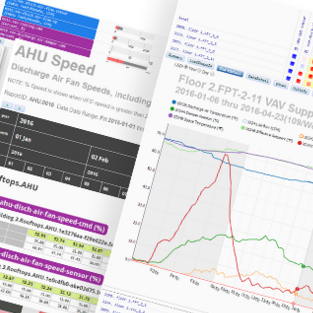 For the portfolio manager with dozens of buildings, this service can send a peak condition alert to all the facility managers who can then deploy the demand response plans that you've implemented. We're already collecting the interval data for ISO New England, NY ISO and other RTOs, and we're happy to offer this free service in exchange for nothing but your email address and mobile number if you prefer SMS alerts. An AEI Soft Start is our most popular product in terms of the intelligence value returned for the cost. It makes the most sense to deploy this on individual buildings or a campus of 10 to 100 buildings that are looking for early intelligence on how the buildings are being operated when compared to others in the portfolio. We'll take the interval data from your electricity and gas utility providers and deliver a wide range of profiles that explain how individual buildings are being operated; by time-of-day, day-of-week, occupied versus unoccupied, versus weather and grid conditions, by season and by year. Normalized to square footage, HDD/CDD, and even process variables if you want to supply the data streams for that. We'll reference the CBECS benchmark data for other facilities in your region to see how your buildings compare. Pricing is per building, and there are steep discounts involved for portfolios of 10 or more buildings. Depending on the richness of your available data, at some number of buildings we'll include an AEI Energy Map simply because it's an easier way to show the results of an AEI Soft Start. Most ideal for portfolios that don't yet have any baseline utility reference baselines, those looking to perform a RCx or ReCx or install a significant ECM and want to establish a current baseline at the main meter to be able to verify the results. Also, for those new to the concept of EUI and disclosure reporting in general, an AEI Soft Start will break down the seasons in your data for a better targeted approach to specific energy conservation efforts. For many buildings smaller than 100,000 square feet, it sometimes turns out that their electricity usage isn't sufficient for a utility "Time-Of-Use" rate schedule. Without the interval data that comes with a TOU account, getting usage profiles for the facility is not possible. The good news is that the utility has already figured out that the usage in the building isn't very high. Or at least it's not high enough where it would be more profitable for them to put the building on a TOU schedule so that they can reap the benefit of demand charges. So when it turns out that such a building has a high kWh/ft2 - but not high enough to qualify for TOU metering - an AEI Soft Start Real-Time delivers the interval data that can yield the valuable profiling information necessary to understand how the building is operating. Not only is the history available, but with real-time data the building is now eligible to receive SMS alerts when it's nearing some user-defined peak condition. And we can learn about it's night and weekend setback positions to insure that even a smaller building is optimized for its intended use. Short of a full RCx, ReCx or CCx engagement, AEI can perform a one-time or seasonal review of the building automation system to insure that equipment schedules are properly programmed, sensors are all properly located, calibrated and reporting accurate data. We'll check the sensor combinations as well - set point sensors are in agreement with the feedback sensors, simultaneous heating and cooling issues, VFD motors in override running 100%, etc. In short, this is a check-up on the brains behind your building's operation and we provide the third-party review for you or your controls vendor. 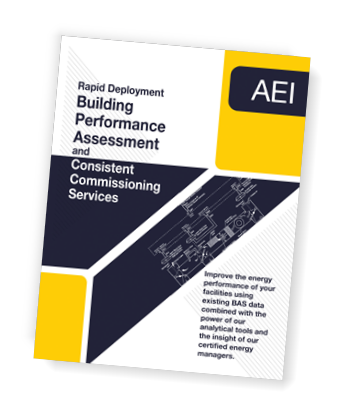 AEI can support your next re-commissioning or retro-commissioning effort with a rapid-response and low-intrusion deployment to establish baseline values, confirm calibrations, and verify the performance of the installed energy conservation measures. Going beyond the initial review, we will put into place the real-time or batch retrieval of all BAS and process data for any RCx or ReCx project you have planned, or for ongoing peace of mind with a CCx plan. In a Continuous Commissioning™ engagement we'll deliver stock and custom O&M reports tailored to the HVAC assets you have, and the knowledgeable facility manager will have access to the AEI Analytics Platform for visual on-demand access to energy assets and data. Since we're about saving energy, we'll develop the cost-to-operate models for your air handlers, chillers, boilers and other assets consistent with ASHRAE standards to insure that your assets are tuned up. We'll track your assets according to NIST, IPMVP and FEMP 4.0 to keep them tuned, and we'll deliver the necessary support for you to acquire LEED 4.0 points. Please contact us for more information, or visit the individual product pages to learn more about how AEI can bring a dedicated effort to your next energy project or help you establish a baseline understanding of where you are today, where your disclosure processes are going, and how you can achieve a more sustainable portfolio through energy insight unmatched by any other solution.